Grab your Lipitor. The fat-washed cocktail trend is taking hold and coming to your local bar. Bartenders at Manhattan’s mixology meccas have long debated who decided to infuse Bourbon with a touch of bacon fat. (For cocktail geeks scoring at home, many credit Eben Freeman at now-shuttered Tailor, or Don Lee at PDT, both in NYC.) But whoever dreamed up the arguably unorthodox (if not downright gross-sounding) concoction, imbibers the world over are happy the bacon craze came to the cocktail menu. To wit: PDT’s Benton’s Old-Fashioned, a mixture of bacon-infused Bourbon, maple syrup and Angostura Bitters, has become the bar’s signature drink in just five years. And bacon was just the start. Justice Snow’s in Aspen, Colorado, has its Good Morning Manhattan (left), made with bone-marrow-washed Old Forester Bourbon. And at Seattle’s Sazerac, Christopher Givens infuses Grand Marnier with duck fat, which he mixes with vodka, Campari and Aperol for his aptly named Duck á l’Orange cocktail. While flavor is certainly paramount, the true appeal of adding fat is about exploring texture and mouthfeel, relatively uncharted frontiers in mixology. 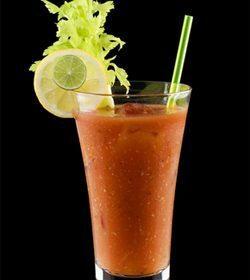 For vegetarians who feel slighted by the fashionable craze, not to worry, you still have a chance to up your cholesterol count with a fat-based cocktail. Butter, it turns out, definitely has its place in the washed-drink movement. PDT just introduced its take on hot buttered rum, mixing butter-infused rum with lemon and pineapple juice, Frangelico, Senior Curaçao of Curaçao Blue Liqueur, cane syrup and bitters, topped with yet another artery enemy: heavy cream. Stir together the Bourbon, maple syrup and bitters in a cocktail shaker filled with ice. Strain into a chilled rocks glass filled with one large ice cube. Garnish with the orange twist. Over low heat, warm the bacon fat in a small saucepan. Stir the fat until it becomes molten, about 5 minutes. Pour the liquid fat into a large, nonreactive container. Pour the Bourbon into the container holding the fat; stir. Cover and let stand for 4 hours. Place the container in the freezer for 2 hours, then remove the solid fat. Strain the liquid through a cheesecloth, and pour the strained contents back into the original bottle and label. Yields approximately 24 ounces. Recipes courtesy Jeff Faile, bar manager of Fiola, Washington D.C.
Stir together the whiskey, Amaro Averna and bitters in a cocktail shaker filled with ice, and then strain into a martini glass. Garnish with a lemon twist. Over low heat, warm the venison fat in a small saucepan. Stir until it becomes molten, about 5 minutes. Pour the liquid fat into a large, nonreactive container. Pour the rye into the container with the fat; stir. Cover and let stand for 4 hours, then place the container in the freezer overnight. Remove the solid fat. Strain through a cheesecloth 2–3 times. Pour the strained contents back into the original bottle and label. Yields approximately 24 ounces. Stir together the Bourbon, walnut liqueur, vermouth, bitters and maple reduction in a cocktail shaker filled with ice, and then strain into a martini glass. Garnish with the lemon twist and bacon. Clean and scrape down the outside of the short bones, removing any excess meat or fat. Place the cleaned bones in a deep-sided roasting pan. Stand the bones up on their ends and roast for 25 minutes. Remove the pan from the oven. Using a small spoon, gently break the structure of the internal marrow just enough to pour the Bourbon inside of each bone. Pour the remainder of the Bourbon in and around the bones. Cover the bones with aluminum foil and place in the refrigerator overnight. The next day, dump all of the bones and the Bourbon liquid into a large, nonreactive container, and shake to disrupt the settled fat particles. Place in a freezer for one week, shaking twice a day. Remove the fat with a spoon from the surface, then strain the Bourbon liquid through a fine strainer. Next, strain the liquid through a cheesecloth, and finally strain it through a coffee filter. Pour the contents back into the original bottle and label. Yields approximately 24 ounces. Add the maple syrup to a nonstick pot set over medium-high heat. Bring the syrup to a steady simmer, then reduce the heat and continue to simmer for 15 minutes. Turn the burner to low heat, and allow the water from the syrup to evaporate for the next 30 minutes. Remove from heat and stand to cool. Bottle and store. Yields approximately 24 ounces. In a bowl, season the bacon with the pepper and brown sugar. Place the bacon slices on a tray lined with parchment or foil, then cover slices with another layer of parchment or foil. Bake for 20 minutes. Yields 12 slices. Stir together the vodka, Grand Marnier, Campari and Aperol over ice, and then strain into a chilled martini glass. Garnish with flamed orange peel. On low heat, warm the duck fat in a small saucepan. Stir the fat until it becomes molten, about 5 minutes. Pour the liquid fat into a large, nonreactive container. Pour the Grand Marnier into the container with the fat. Stir. Cover and let stand for 3 days. Place the container in the freezer for 2 hours, then remove solid fat. Strain through a cheesecloth twice. Pour the contents back into the original bottle and label. Yields approximately 24 ounces. If these fat-washed tipples tickle your fancy, upgrade to the innovative Bacon & Eggs cocktail. Rather than using a meat-infused liquor, it incorporates meat straight into the drink. In a cocktail shaker, top one slice of bacon with ice; muddle well. Add the Bourbon and maple syrup. Shake vigorously and strain into a rocks glass filled with new ice. Whip the egg whites and simple syrup together until frothy. Pour the mixture on top (it should float like the head on a beer). Garnish with ½ slice of bacon and the lemon peel.